L-R Dark Romance, Matte Topcoat, Alabaster, and Smoke And Mirrors. This is a matte collection! I did a very similar mani to this a few months ago but I think this one is better! 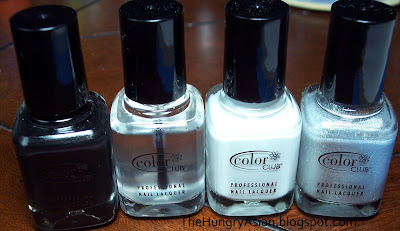 I used all 3 colors by painting 2 coats of white on half of my nail and 1 coat black on the other half. Then 1 coat of silver down the middle. My favorite of the bunch is Smoke And Mirrors, it has the finish of unpolished aluminum and super opaque I just love it. Here is no topcoat, and drying time was super fast on all 3 of these. Wow! 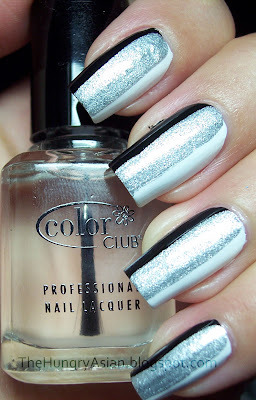 This is such a nice mani! I will have to try this as son as I get this set :) love your nails. That mani is awesome! I might try something like that! Wow so pretty and sleek! You're so great at nail art. Smoke and mirrors is beautiful! Love this mani and update us on the matte top coat. I love how straight this one is, very futuristic ^_^ I wish my hands were that steady! Love those colors. Your mani is so cool! That is lovely and sharp looking. Amazing design. Thanks! It's super easy since you dont have to be perfect with the side colors. thanks, it's quick and easy too! I agree! Thank you, I will have to try that topcoat on some stuff soon. Mine didn't go matte either! I sent an email to color club to ask if i did something wrong.